We’d love your help. Let us know what’s wrong with this preview of God Wars by C.B. Stone. To ask other readers questions about God Wars, please sign up. Professor St. John, is a minister whose faith brought him through atrocities and heartbreak. Professor Jackson is a man of science; he's arrogant and in his quest for power, Jackson deems no need or place for God/religion. He blames the worlds problems on false hope and promise. The ugliness and terror of this Unbelief follows in the God Wars! Prophecies are passed down through families. Childen grow, marry and have children of their own. What kind of world will they inherit? Gripping and riveti Professor St. John, is a minister whose faith brought him through atrocities and heartbreak. Professor Jackson is a man of science; he's arrogant and in his quest for power, Jackson deems no need or place for God/religion. He blames the worlds problems on false hope and promise. The ugliness and terror of this Unbelief follows in the God Wars! Prophecies are passed down through families. Childen grow, marry and have children of their own. What kind of world will they inherit? Gripping and riveting, this is a story of guts without immediate glory; of faith and trickery in a dystopian world gone horribly wrong! If this book doesn't put a fire under you, I don't know what will. I look around and I see the beginnings of the persecution that occurred in this book. I saw it before I read it. Are we supposed to sit back and let it happen? I don't think so. Anyways, God Wars is the 4th book in a series. I received this for free while it was on sale. I haven't read the first 3 books yet, but I will now. This is a prequel to the first 3 explaining how we came to be a "Godless" society. All the while, there are If this book doesn't put a fire under you, I don't know what will. Anyways, God Wars is the 4th book in a series. I received this for free while it was on sale. I haven't read the first 3 books yet, but I will now. 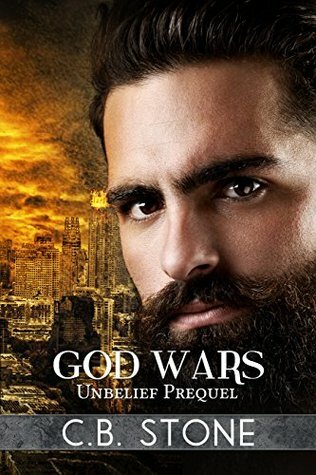 This is a prequel to the first 3 explaining how we came to be a "Godless" society. All the while, there are those who hold on to their faith in secret and continue to live through this horrifying time. On any given day, you might find Stone pounding away at a keyboard in sunny Florida, contemplating waves, contemplating li C.B. Stone is sometimes called author, writer, or purveyor of stories. One might even dub her a yarn spinner, if you will. It’s very possible she might be considered just a little left of normal by most, but she’s cool with that. Really, she’s too busy avoiding normal to care.